For 12 years, the Air•E•Ator� has set the standard for performance athletic socks. The 'King of Multi-Sport' Air•E•Ator� is a true original. 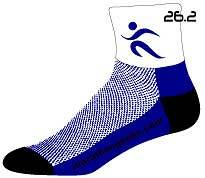 With more victories in top-level endurance events than any other sock, Air•E•Ator has a distinguished record. The best part is that this race-proven sock is an active lifestyle sock that can be worn everyday, workout or not.